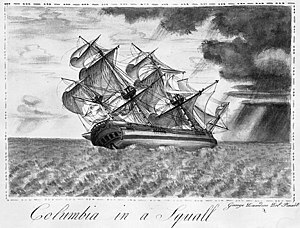 Columbia Rediviva (commonly known as Columbia) was a privately owned ship under the command of John Kendrick, along with Captain Robert Gray, best known for going to the Pacific Northwest for the maritime fur trade. "Rediviva" (Latin "revived") was added to her name upon a rebuilding in 1787. Since Columbia was privately owned, she did not carry the prefix designation "USS". Columbia heeling as she approaches a squall. Drawing by George Davidson in 1793, who served as the ship's artist. Length: 83 ft 6 in (25.45 m) on deck. Armament: 10 cannons, 2 heavy stern chaser guns, 4 heavy and 4 lighter broadside guns. Early authorities claim the ship was built in 1773 by James Briggs at Hobart's Landing on North River, in Norwell, Massachusetts and named Columbia. Later historians say she was built in Plymouth, Massachusetts in 1787. In 1790 she became the first American ship to circumnavigate the globe. During the first part of this voyage, she was accompanied by Lady Washington which served as tender for Columbia. In 1792 Captain Gray entered the Columbia River and named it after the ship. The river and its basin, in turn, lent its name to the surrounding region, and subsequently to the British colony and Canadian province located in part of this region. The ship was decommissioned and salvaged in 1806. A replica of Lady Washington is homeported at Grays Harbor Historical Seaport in Aberdeen, Washington. Simeon Woodruff, under the command of Kendrick, serving September to November 1787. A former gunner's mate during the final voyage of Captain James Cook, R.N., was the only man in the entire Columbia Expedition leaving Boston on the first voyage to have been to the Pacific. Joseph Ingraham, under the command of Kendrick. In 1790 he was captain of Hope, which competed with Columbia in the fur trade. Robert Haswell, under the command of Gray in 1791–93 during the second voyage to the Pacific Northwest. In 1958, a full-scale replica of the ship opened as an attraction, named "Sailing Ship Columbia", in Frontierland at Walt Disney's Magic Kingdom of Disneyland, and the three-masted vessel continues to ply the Rivers of America there most days of the year. Contained within the hull is "Below Decks", which is an exhibit of nautical artifacts from the 18th Century that passengers can visit while on board. In 1969, the name was used for the Command/Service Module of Apollo 11, which landed humans on the moon for the first time. In 1981, the name was re-used for the Space Shuttle Columbia by NASA. ^ Jacobs, Melvin C. (1938). Winning Oregon: A Study of An Expansionist Movement. The Caxton Printers, Ltd. 77. ^ a b Howay, Frederic W. (1941). 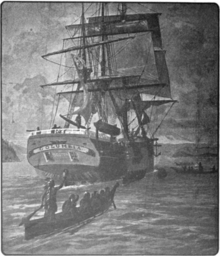 Voyages of the Columbia to the Northwest Coast 1787-1790 and 1790-1793. Boston: Massachusetts Historical Society. ^ Hittell, Theodore Henry (1885). History of California. Occidental publishing co: v. 3-4:. Log of the Columbia, 1790-1792. Proceedings of the Massachusetts Historical Society, Third Series, Vol. 53, (Oct., 1919 - Jun., 1920). Nokes, J. Richard (1991). Columbia's River. Washington State Historical Society. pp. 79–83. ISBN 0-917048-68-7. The American flag that circumnavigated the globe with Captain Gray on the Columbia.